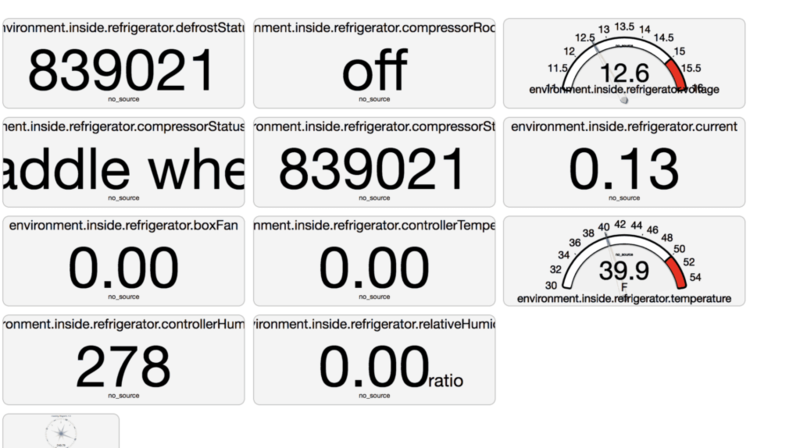 The Stainless Lobster Fridge Optimizer still remains one of my favorite additions to Grace, mainly because of the massive power savings and visibility it provides. 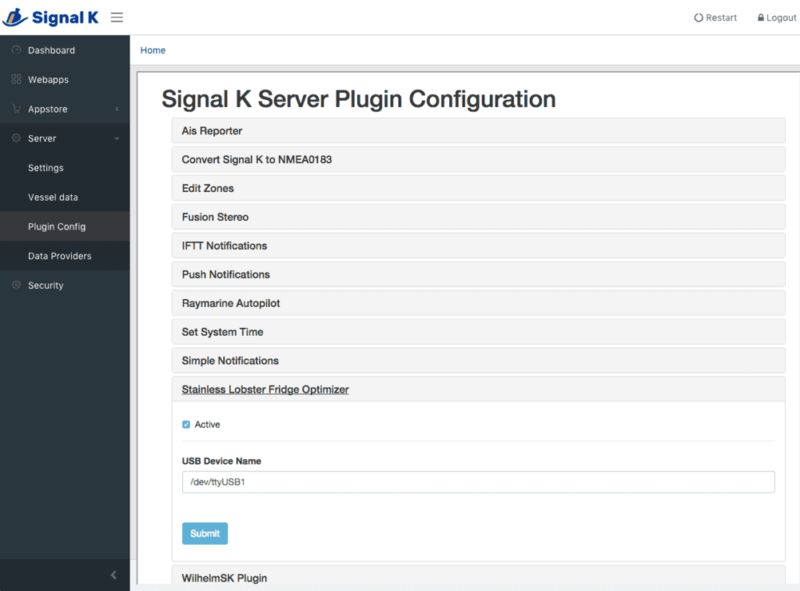 Recently, the folks at Stainless Lobster released new firmware that supports output of stats via the USB port on the unit, and Scott Bender wrote an app for SignalK to parse this info. 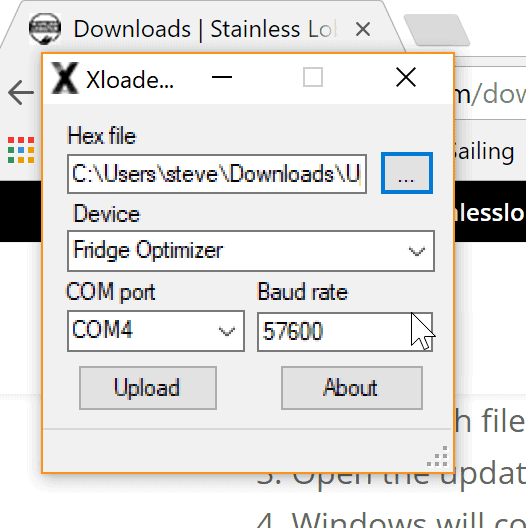 Now you can see details from the Fridge Optimizer within various SignalK applications, which is one of the things I mentioned in my original review that would be nice to have! Here’s how to get started. Head over to Stainless Lobster’s support site and download the updated firmware. You’ll need a Windows laptop with a free USB port and a USB cable with a mini B plug (not micro). Once you have it downloaded, extract the zip file and run the update2 installer to get the firmware updater installed. Stainless Lobster has a good set of steps to get this part taken care of. 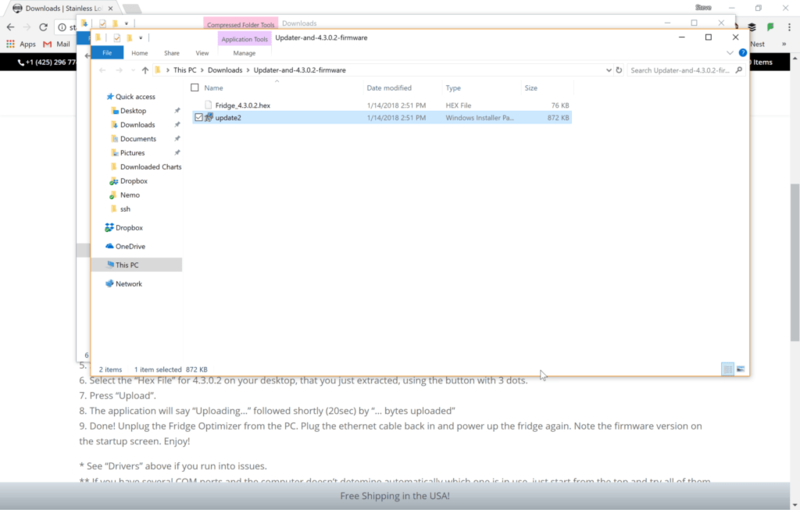 Following their instructions, I disconnected my Fridge Optimizer from the RJ45 ethernet cable and connected my USB cable to my Windows machine and the Optimizer. 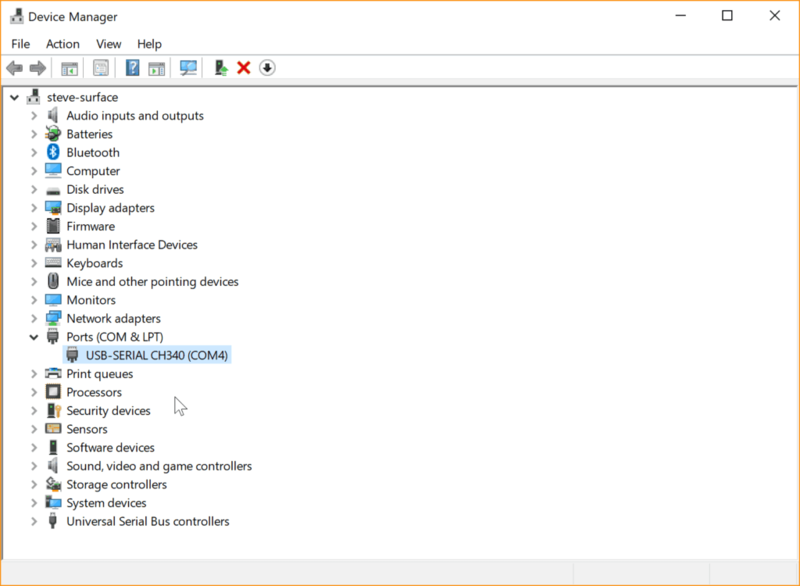 Head over to Device Manager to find out which COM port is being used – makes the next step much easier. Stainless Lobster suggest just trying any listed until you find the right one, but I prefer to do it this way. Find the firmware file you downloaded and ensure that is in the top box, choose the right com port, and hit upload. You can see the updated version number show up on the Fridge Optimizer once it reboots. I am using a Raspberry Pi for my SignalK machine on Grace, so connecting it was as straightforward.In order to use this functionality, you will need to have a more recent version of SignalK and have it running on a machine of your choice with a free USB port. To get things going, I reconnected the RJ45 ethernet cable to the back of the Fridge Optimizer, then USB from that to the Pi. I noted the USB device, which in my case is ttyUSB1. You’ll need to install Scott Bender’s signalk-stainless-lobster-fridge from the Appstore in your SignalK admin area. He has a bunch of other apps I use in my SignalK setup including some to control my Fusion stereo and Raymarine autopilot. Once you have it installed, make sure to go into Plugin Config, make the plugin Active, and configure the USB device that you found when you plugged it in. You’ll also need to restart your SignalK server at this point. 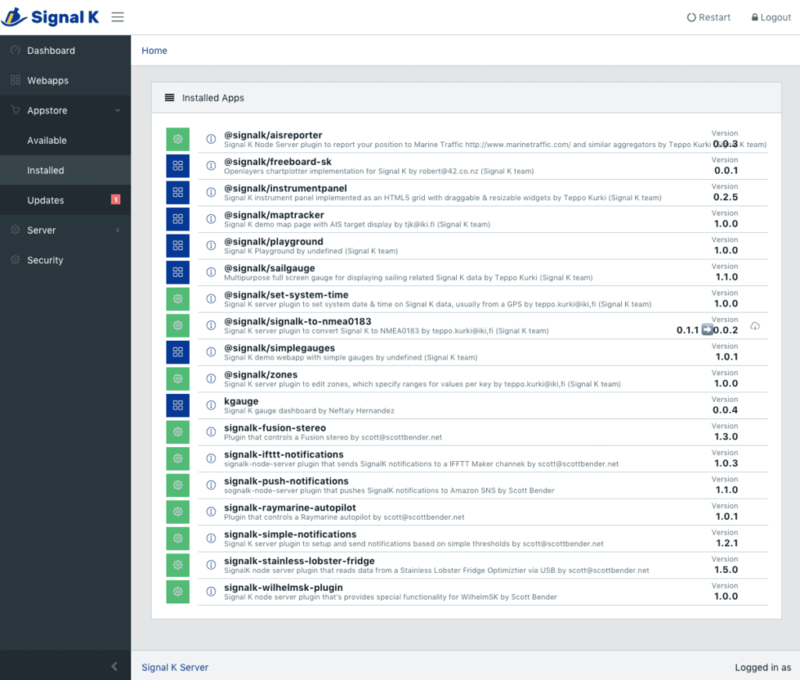 Once everything is working, you should see Provider Activity on the main dashboard showing signalk-stainless-lobster-fridge. I decided to use the wonderful Instrument Panel app written by Teppo Kurki, which has been my go-to app for SignalK for just about anything. You can see above that I have a number of new items on the dashboard coming directly from my Fridge Optimizer. I chose to configure a couple of them like gauges for the voltage and temperature. You can also see there is still a bit of work to do to get the data into a usable format for some of the items. This isn’t atypical of new data types in SignalK and I expect the folks there will whip things into shape soon. Scott Bender also develops the best app to use with SignalK – WilhelmSK. Above is a screen shot he provided showing his Fridge Optimizer data in the app. With my VPN capabilities, this means I am able to check on my fridge status from wherever I am. 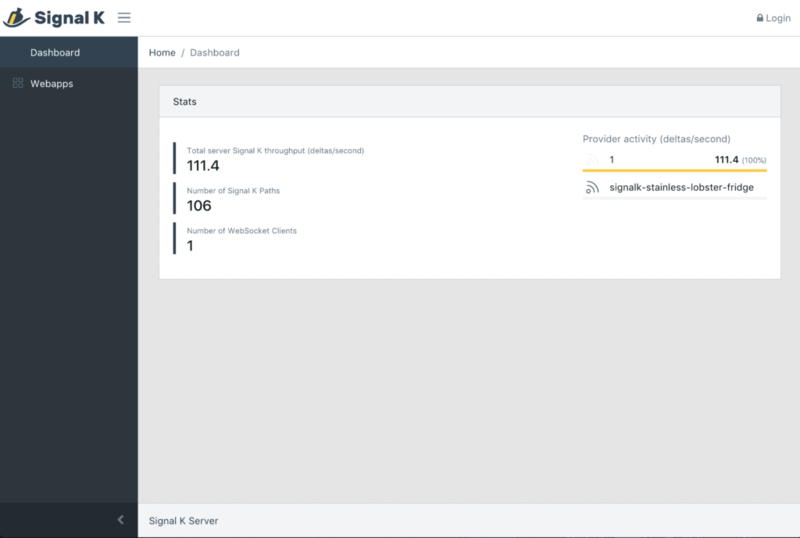 The other really exciting thing that I will be writing about soon is the addition of longer term data logging to SignalK. Above you can see a dashboard in Grafana showing Scott’s fridge data. The possibilities for these sorts of dashboards are endless, and is a pet project of mine that I have been working on since the early 2000s, so you can see why I would be a bit excited about something like this! I’m very excited whenever there is more data, and am really happy that the Fridge Optimizer is now something that I could check from anywhere, not just looking at their nice panel. I look forward to more vendors integrating with SignalK.